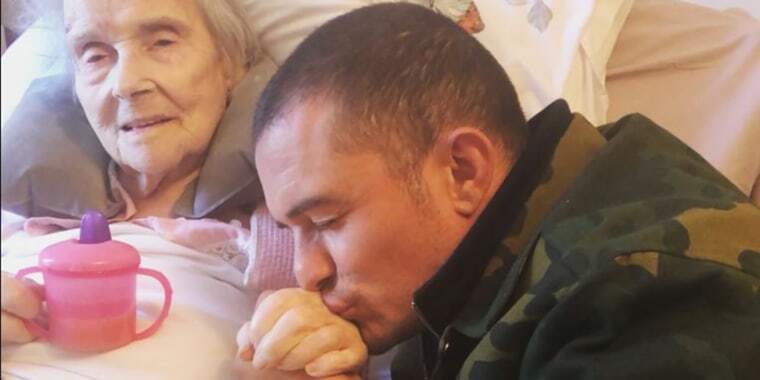 The actor posted a series of photos from the bedside of his beloved 98-year-old grandma, as well as a moving message. Orlando Bloom is preparing to say goodbye to one of the great loves of his life — his 98-year-old grandmother, Dorrie. The actor shared a trio of photos of him seated at her bedside Thursday, as he smiled, kissed her and held her hand for what he knew could be the last time. "Cherish the memories and moments and celebrate and respect the life," the 41-year-old wrote alongside the beautiful photos on Instagram. "We all smile we live we laugh and we embrace a grandmother a mother a sister an aunt a wife a girlfriend a daughter a friend a child a newborn we are born we grow old we get sick and we die." "This we know," he explained. "So love and give love." And there's no doubt about his love for his grandmother. "98 years and I’m so glad I got to be a part of them," he continued, writing openly about her life and their bond. "And as I lie awake pondering and knowing that she too will pass soon now perhaps before I wake I pray I smile I shed a tear or two at the memories of Sunday lunch with Yorkshire pudding (she made it the best) and roast potatoes and beans from the allotment and pudding and humbugs and walks in the fields or along the canals and knitted cardigans." "I am so grateful for my grandma," he added. "Dorrie I love you." He closed with a single heart emoji, but the love continued in the comments that followed his post. In addition to messages of support from his fans and followers, the "Pirates of the Caribbean" star also got a special note from girlfriend Katy Perry. "Love you angel," she wrote. And Bloom's close friend, model Helena Christensen, responded with empathy and a story of her own. "My sweet loving beautiful grandma passed away at 100 and I miss her so, so much," she wrote. "Every single day I think of her and my heart sighs but I am so grateful I had her in my life for so long and I will cherish all the memories in my in my heart always." Just as Bloom will with Dorrie.